What is the difference between sulfured molasses and unsulfured molasses? Molasses can be sulfured or unsulfured. If your molasses is sulfured, that means sulfur was added to sugar cane during molasses production as a way to keep the sugar cane fresh until processing, killing unwanted bacteria, and helping to whiten the resulting sugar crystals. In terms of recipes, there should not be a difference if you use either type of molasses. The sulfur dioxide used during manufacturing does not add or take away from the molasses's nutritional profile; however, if you are allergic to food preservatives that contain sulfur, look for the unsulfured variety when your recipes call for molasses. What is this molasses made from? All Golden Barrel molasses is made from sugar cane and has no additives or preservatives. 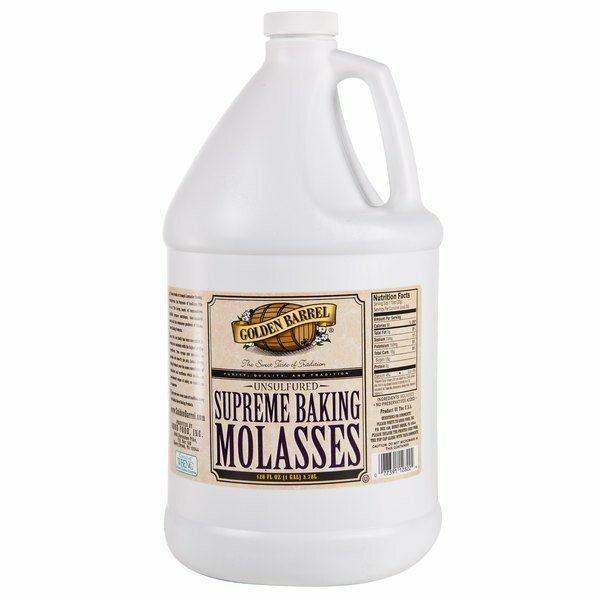 Add warm brown color, moisture, and savory sweetness to your favorite recipes with this gallon container of Golden Barrel Supreme baking molasses! This baking molasses, made from cane sugar, is the result of a process in which sugar syrup is boiled down in order to create sweet, viscous liquid. This molasses, unlike refined sugar, is packed with flavor and contains important daily minerals such as calcium, magnesium, potassium, and iron! Substitute this healthier, sweet molasses for sugar or other sweeteners in any recipe! Add robust flavor to confectionaries like cakes, muffins, pies, and cookies, or any number of dishes. Golden Barrel offers the highest quality baking products made from the finest ingredients. This richly flavored, unsulfured, nutritional baking molasses comes in a sturdy, white plastic one gallon container. Our bakery is famous for our molasses cookies. The secret? Golden barrel sulfur free supreme baking molasses. We mix this with the blackstrap to make an awesome cookie! Initially, we were concerned about the quality of this molasses- since the price was so low. However, as with our other purchases from this website, we were pleasantly surprised. It was exceptionally good. You would be hard pressed to find a better value. A true molasses taste without all the bitterness. We don't use brown sugar in our kitchen, so molasses goes into most of our baked goods. Our molasses cookies taste better since we switched to this brand. We really like the Golden Barrel Molasses I use it in making our signature bbq sauce and we really like the flavor it give to the barbecue. Who doesn't need a gallon of molasses? I bought this for my boss because had started making large quantities of gingersnaps. We are now on our 2nd gallon in a year. It is a great product at a great price. This is great for multiple uses! I use it for Christmas baking. I also use it for adding to my oatmeal or quinoa in the morning. It has a great taste and is much more economical in the gallon size. Really a great Baking Molasses, at a very nice price!! I bought this molasses specifically to use in making light and dark brown sugars at home -- which saves money, and also prevents having your brown sugar harden (over time -- but you can microwave hardened brown sugar, in short 5-10 seconds intervals, checking on it, to soften it again). Thank you, Webstaurantstore! Very high quality molasses proving not only to have a great taste but as you can see it also excels in price. If you use molasses to sustain a business or even a household you will not find a better deal in terms of quality and price anywhere else. Definitely worth a try. This is a great molasses. It taste like the Grandma's we used to get in the grocery store. It is cheaper to buy the gallon (even with the shipping) than it is to buy the individual bottles at our local Publix. It is great to have for the Christmas/winter season, since we make so many gingerbread men/snaps/cake. Great price & a great product. We use molasses in a few of our breads as well as our Swedish cookies and I was glad to find this sulfur free molasses for such a great price! Better tasting than the small grocery store bottles of molasses (I used to buy Grandma's), it tastes sweeter and less bitter, but still complex. It seems not quite as thick as the grocery store molasses though, so watch out when you're pouring it. I put it in an old honey squeeze top bottle and measure it out by the tablespoon to make brown sugar (1T per cup of white sugar for light brown sugar, 2T per cup for dark brown sugar). You can make over 200 cups of brown sugar with one gallon! Now that's cost savings! Makes delicious brown sugar too. Little jars of molasses at the grocery store are very pricey. As someone who bakes a lot, it makes much more sense to buy a gallon. Keeps a long time and is a great value! A nice light molasses that is good for baking in dishes where a strong molasses flavor is unwanted. Flavor is stronger then sorghum but lighter then a medium to dark molasses. We have mixed a dark blackstrap with it to create a more intense flavor. Great for the price and we will order again. We bought the blackstrap molasses first, and found the taste to be very bold. We bought the baking molasses to see if it would make a difference. In the end we found that each molasses has its useful recipe, you just need to experiment. We think the quality is great on both of them and would highly recommend. As good as what's in the local market that costs much more. This helps to make baked treats taste really good. This being sulfur free is also a plus. I used to use Full Flavor Molasses for my rye breads. It's such a delicious molasses that I was hesitant to switch to this Golden Barrel Molasses. I decided to try it because the kind I used to use is only available in the small retail jars and can get expensive. I'm very happy with the Golden Barrel. It tastes pretty close to the other brand. Unfortunately, I did not do a aside-by-side tasting, but I'm very happy with it. I am about to order another gallon. I order this product again and again. We make a lot of Molasses cookies for our shop. We even have customers with horses that like our baking products. Get our ginger her to add to them also. I bought this to use in cookies and it's great because it's not that thick, tar-like molasses that you can get other places. It's been fine for our cookies. So very glad we searched for molasses on Webstaurant. We saved a lot versus the small bottles were are able to find in the grocery store. Great find. Love it! The color is darker than the kind I got at the grocery store, so this stuff is great if color is part of the reason you are using molasses. I like getting the 1 gallon containers instead of buckets, because I've heard the buckets can stratify a bit if you don't use them fast enough. Finally, the price is SO RIGHT! Loved the price for this molasses and the brown sugar and gingerbread cookies we made from it. My husband loved the smell and seeking spoonfuls of it. This molasses is richer than those smaller, highly expensive in comparison store bottles. I love the full bodied flavor in my sweet and tangy BBQ sauces and even use it in my cookies and other baking along with white sugar when I run out of brown sugar. Awesome pricing. A gallon lasts me quite a while. Much thicker than regular molasses, this works very well in some very particular cookies we make. We love it and won't use anything else! Great! Perfect! Great price, easy to pour. I did feel a little like a hoarder buying a gallon of molasses, but since I cook all the time and make my own brown sugar, I got over it! Love this product and the fact that it comes in gallon size bottles for bulk measuring! This made all the difference in our bran muffins! Great product & price. I've been baking molasses cake, molasses cookies, gingerbread & using the molasses in other baking & cooking recipes, they are delicious! The best I've used. I found this to be the best molasses ever. I have used several brands and this offers a smooth flavor for gingerbread and cookies. Dont doubt it just because its a great deal, this is the stuff to use. Excellent quality and flavor molasses! Molasses cookies are one of my top sellers and I was nervous to switch from Brer Rabbit, but the cost was killing my profit! This molasses is delicious and my customers are extremely satisfied. So is my budget.